I really like to have a clean house. This is challenging because I live with a toddler. I never knew how much of a control freak I was until I involved my two and a half year old daughter in cleaning the bathroom. Working with a toddler, my first lesson is that getting things clean becomes less important than keeping the walls dry. Trying to keep her (and me) from slipping on the wet marble, visions of us both cracking our skulls haunt me. But while she happily scrubs the walls with a terribly soppy sponge, she’s having fun while I freak out. I try to keep it to myself, though. I smile and encourage as much as I can. Because: I want her to learn that we clean the house sometimes. I want her to see that it’s not just a chore, that it’s fun. And she wants to help. I know that some day she will lose interest, so I try to savor the mess we’re making under the pretense of cleaning. When I was in graduate school and working full time, I got used to watching my standards drop. It was not comfortable at first, but then a simple equation developed: The floor didn’t always need to be clean AND I definitely needed to read, write, etc. I’d clean when the semester was over. Cleaning with a toddler is at least twice the work of cleaning alone. For a long time I would only clean when she was sleeping or out of the house. But, if I want her to learn that this stuff is important (at least while she’s not in graduate school) I’m learning the truth inside the cliche: the process is more important than the outcome. And if it takes twice as long, at least the walls will be clean. Too true! My younger son loves to do stuff in the kitchen with me (cook and wash dishes), help in the yard, spray things with his water bottle … basically a much tidier person than his brother. I wonder how much is just him, and how much is that he was the baby and always around when I was cleaning. His first recognizable gestures were wiping the top of his highchair tray and shaking his head “no” — I figured that’s all he saw me do all day! To help with the housework. Who’s doing the housework on TV. That there is in the whole wide world. But I’ll tell you one thing I know is true. That mention those wonderful soaps and detergents and cleansers and cleaners and powders and pastes and waxes and bleaches. 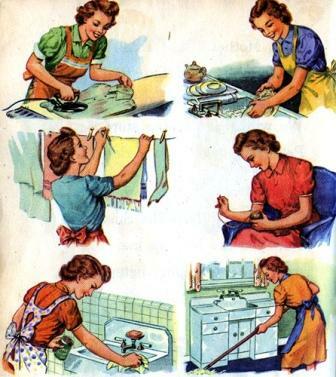 Remember, nobody smiles doing housework but those ladies you see on TV. And when you grow up, so will you. Housework is just no fun. That you don’t have to do it alone. That you do it together! meli65, yeah, it’s pretty unnerving when I see my reflection in my child. Today I watched an old movie (from about a year ago) of my daughter telling the cat, “Go, go!” trying to get him to move. Later, after my daughter tore open a (dry) teabag and emptied the contents on the floor, I was enlisting her help to clean it. Dante (the cat) was in the way. I said, “Go, go!” to him, then shivered, realizing that in the old movie, she was 100% mimicking me. Hard to be held accountable! Karen, thanks for the memory! I have that CD from the library now, I need to go listen to it!